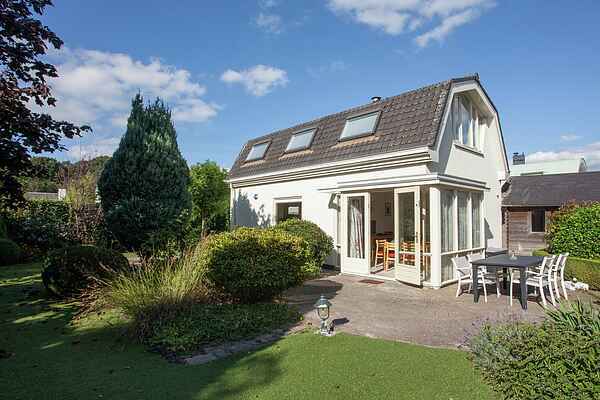 Holiday home De Luwte is in a quiet location, a modern house in a small holiday village outside Noordwijk aan Zee, directly facing the dunes. Comfortably decorated for four to six people with the beach, sea, and forest within walking distance. This house, built in cottage-style, is modern and comfortably furnished and has space for up to six people. You can park in the driveway and enter the house through the hall. The spacious and bright living room is situated on the ground floor. From the sunny conservatory, you can easily walk into the large and beautifully landscaped garden, where you can sit or barbecue on the terrace. Two golf holes have been incorporated in the lawn's artificial grass, so you can practise your putting. The modern open kitchen is fully equipped. Two bedrooms and a bathroom are on the first floor, an additional room with a double sofa bed is located in the basement. From this house you can be on the beach in no time and it is a good starting point for hiking and cycling trips through the forest and dunes or the Bulb Region (Keukenhof). The cities in the surrounding area are also worth a visit.